If you’re wanting to make a pirate movie but you’re told that you can’t afford a ship, wouldn’t you think you might decide to make a different type of movie? Unfortunately, that didn’t stop production on a seldom-talked about non-horror effort from Hammer Film Studios called Pirates of Blood River (1962). However, by the time filming was finished, several of the cast probably wished it had never happened. Hammer regular Jimmy Sangster had the unenviable task of writing a pirate story that had nothing to the do with the seven seas and everything to do with a swamp. So, if pirates are landlocked, are they still pirates? This movie is set entirely on the Isle of Devon, home to a group of Huguenots under the stern rule of a group of village elders imposing their moralistic views upon everyone. Break a law and you’ll be sent to the nearby penal colony, even if you’re the son of one of the elders. Enter our hero, Jonathan Standing (Kerwin Matthews, The 7th Voyage of Sinbad), son of Jason Standing (Andrew Keir, Five Million Years to Earth). As our movie begins, Jonathan is caught having relations with a married woman. As he is held by guards, the woman runs, eventually entering a nearby swamp and being devoured by ravenous piranha. Jonathan is sentenced to the penal colony despite the obvious displeasure of the community. However, he soon escapes and runs into a group of pirates led by Captain LaRoche (Christopher Lee). LaRoche is looking for a home when his men aren’t being buccaneers and Jonathan’s village is the perfect place. Once he hears its home to Huguenots, dreams of rumored fortune plays into his decision to find the village. Naturally, a confrontation occurs with the pirates eventually finding the gold and heading back to their ship with Jonathan and the villagers in hot pursuit. And let’s not forget those pesky little piranha. Pirates of Blood River is definitely an odd entry from Hammer. It’s a pirate movie without a pirate ship (well, what we see is a long shot of stock footage) and the village rulers you hate at the beginning of the film end up being the heroes of the piece. 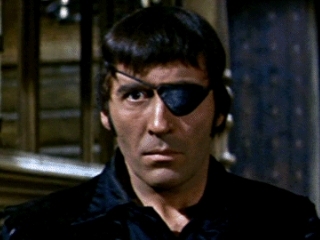 Christopher Lee turns in an adequate performance as our pirate with support from Oliver Reed and Michael Ripper as pirates Brocaire and Mack. Kerwin Matthews is dashing as the main hero but Glenn Corbett’s performance as Henry is about as exciting to watch as paint dry. It’s painfully obvious that the budget was quite small on this one, with only a handful of smaller sets and the swamp, which was really a pond at Black Park. Filming there was hazardous due to excessive mud, sludge and disease. 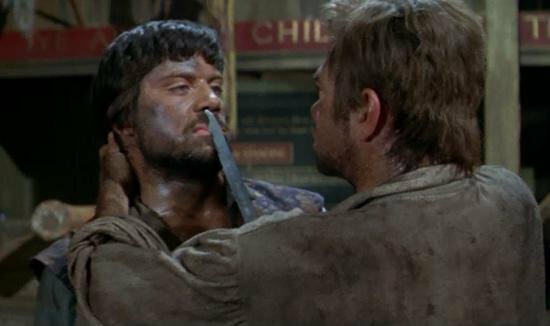 Oliver Reed contracted an eye and ear infection while Michael Ripper nearly drowned and Lee claimed he couldn’t walk upstairs for six months. The piranha sequence at the beginning of the film was originally much more intense before the censors cut it down. In fact, the censors even reportedly removed all of the piranha scenes at one point along with the blindfolded swordfight. However, those scenes have since been restored. The crew certainly comes with an impressive list of credentials. Director John Gilling was a staple of Hammer, including such films as Brigand of Kandahar, Plague of the Zombies and The Reptile. The writing staff consisted of John Hunter (Never Take Sweets from a Stranger) and John Gilling (The Gorgon), along with Jimmy Sangster (Terror of the Tongs, The Mummy) and another longtime Hammer contributor, Anthony Nelson Keys. However, despite a good cast and crew, Pirates of Blood River really falls flat. It lacks excitement and, at times, you find yourself shifting from one plot (unhappy villagers, stern rule, fornicating wives) to another (pirates in search of gold). A few scenes are fun but the endless walking through the swamps can be tough to wade through. 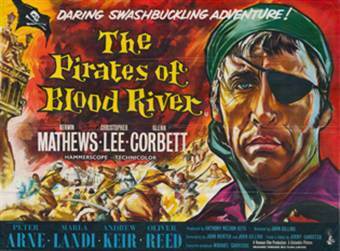 Pirates of Blood River is currently available and reasonably priced as part of the Icons of Adventure DVD box set. Check out the trailer on YouTube and have what fun you can with this one before listening to the recent 1951 Down Place podcast review. Perhaps an early Sunday morning over some breakfast and tea would help make this one a little easier to get through.